Charles I'd like to raise a point about the direction in which to block after a 3-3 invasion behind the 4-4 point, in the case of a six-space extension. Obvious to block at a? Supposing a black stone also at one of the circled points, then the block on the wider side proverb tells you to play at a. Now blocking at a is unlikely to be a bad play - it should always be quite efficient. It might however not always be an ideal play. After all, a wide extension could be too wide. And in the most standard joseki after the invasion at , White does end in sente. So perhaps some more concrete analysis is called for, in a given position. In all the examples I saw from pro games in recent times, played in the narrow side as here led to this result (Black 11 at b to capture the corner). 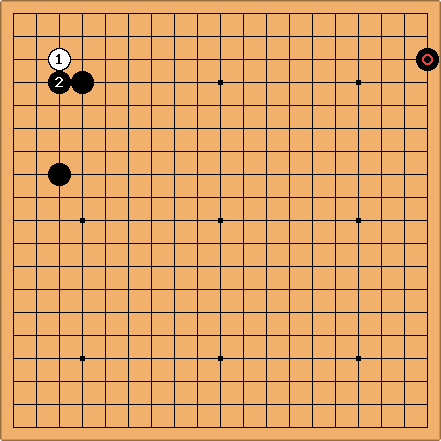 Now as all sneaky players know, there is some bad aji left in Black's position near the circled point. Therefore perhaps the positioning of isn't too close. aLegendWai (9k? KGS): But is it because B chose to play the 3-3 invasion double-hane joseki (instead of the standard 3-3 invasion non-hane joseki)? Otherwise the is a bit too narrow (the problem of Overconcentrated shape) in general wisdom point of view. Charles Playing the other variation (the standard one) is going to leave the upper side stone on an uninteresting point, It would be strange to see that in high-level play. aLegendWai: What I mean is if the player choose to play the standard one, it will block the upper side (ie at ). But since it choose to play the double-hane one, so it choose to block the lower side. That's my idea. What do you think? Charles I think it is the other way round, really. 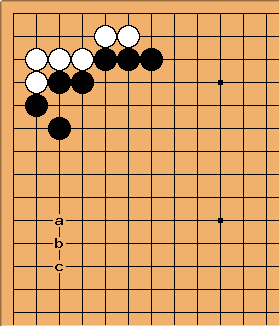 The diagram shows a very good play at the point marked with the square, if Black wants to attack; and is far enough away not to be in immediate trouble. The end result 'fits' very well with the and stones. If the decision is (a) which side to block and then (b) which variation, then (a) comes first. In practice though, a strong player will simply form a judgement on the final position. aLegendWai: So it is 'reading backward' that the pro is applying - try to choose a variation which make full use/efficiency of its friendly stones. "Try to block on a side where it is not too narrow or too wide." aLegendWai: Correct me if wrong. Related to the guide: "To block on the wider side", I would rather say we should block a side where the supporting stone is not too near (because of over-concentrated) or not too far (because of easy invasion). So we should say, "Try to block on a side where it is not too narrow or too wide." Then where the friendly stone should be placed in order to be regarded as approprite? "e"/ "f" is considered to be too wide. It is too easy for the opponent to invade and destroy the moyo. So next time, when you see you have a friendly stone at "c"/"d" on one side; another friendly stone at "a/b/e/f". You will know where to block. Block the upper or lower side? According to the rule, "Block On The Wider Side". It seems suggesting to block the lower side. However it is not true. The stone at lower side is too wide that an invasion is too easy to destroy the framework. aLegendWai Don't think that is too far away from the wall. If you think is the maximum acceptable extension, you probably mix up with the following simple situation. An invasion at "a" is possible. But it is not that severe. So it is acceptable. 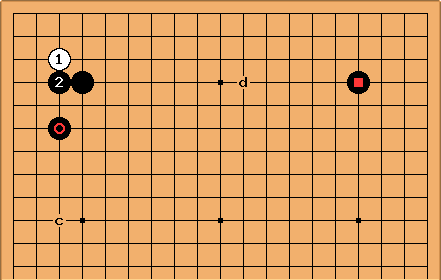 aLegendWai (revised): Now since B has a strong wall from the corner after the completion of 3-3 invasion joseki, one-space more (ie at ) is totally fine. Even if W invades instantly, the good wall can help to punish the invader. aLegendWai (original): Normally the point at is the max. three-space extension. A four-space extension is too wide and is likely to invade easily. 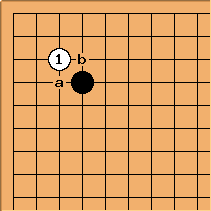 However since B has a strong wall on the upper, one-space more is considered to be fine. Bill: Sez who? The rules of thumb about extensions from a wall do not apply to a wall with eye space, like this one. A 6 space extension is not too far. Do not approach strong stones. Charles I agree with Bill - this comment is misleading. 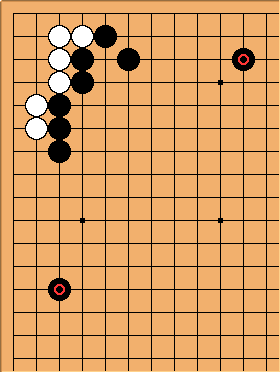 What is more, I have seen a number of examples where White immediately caps at a, and Black plays tenuki. The black wall is strong. alegendWai: The one Do not approach strong stones appears to be another topic. It is usually served as a guide where its stone should be played when someone gets sente. And one guide is to play away from the thickness (eg you have a strong wall on the left corner. It is not urgent for someone to convert the framework into real territories by playing a stone nearby instantly). Oh! Did I misled you both about something? Ok. I rewrite my sentences. Try to illustrate better with diagrams. I once said the stone at "d" (ie ) is fine (I like it most^^) in the diagram called "Where the helping stone should be placed". One may choose not to follow this rule if one is going to play non-standard 3-3 invasion joseki. 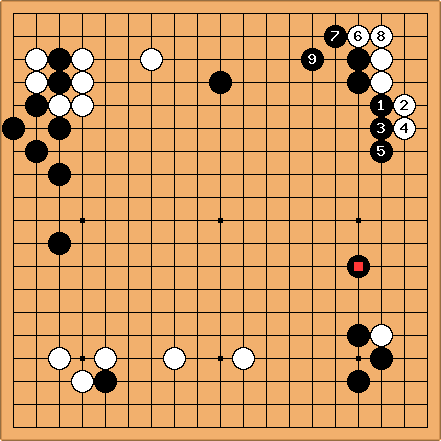 For example, 3-3 invasion double-hane joseki. 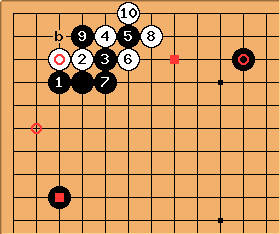 For the normal standard 3-3 invasion non-hane joseki), its purpose is to build influence and sacrifice territories in the corner (and some on the side). It is most likely for this play to follow my modified guide. My analysis doesn't take the whole-board view into account. It only takes a quarter and in a simple case. Remember, if there're friendly/enemy stones nearby 4-4 point, the case varies. It is beyond the scope of the rule. finally, use your common sense to judge. Although I help you to define more in my rule, it is still far from perfect and complete. Rule is rigid. You are flexible. Try to block on a side where it is not too narrow or too wide. Try to block on a side where it has a friendly stone at "c/d". If you can't find it, block on a side where it is nearest to "c/d". My pieces are still raw. Hopefully I can become much stronger and can write more sophiscated ones. See you all in future. Bill: I, for one, welcome your arguments. :-) Question authority. However, I think that any fierce responses you are getting have more to do with style. You sometimes give the impression of trying to set yourself up as an authority. aLegendWai: Do you mean the tone in my writing is a bit too authoritative? No, never in my mind. I am not an authoritarian. On one hand, I would like to challenge authority when I doubt it; on the other hand, I would like people to challenge me when they doubt my ideas. I do think it is a better way of learning. 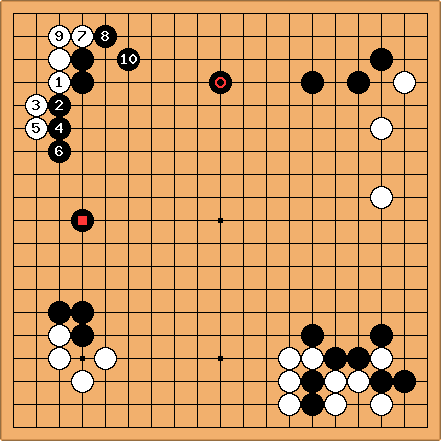 Bill: Most of those who disagree with you do not have much to learn from you about go. Maybe you learn better when people challenge you, but maybe not everybody likes to teach that way. For an example of what I mean about setting yourself up as an authority, consider where you take it upon yourself to explain what a 3-dan meant. You give an example diagram and claim that White's play is correct. Unfortunately, it is not. And on this page, when Charles and I say that a four space extension from Black's wall is not fine (as you say), your response is to suggest that maybe we misunderstood you, and then to claim that the extension is totally fine. Wait. Let make things clear. So as you say four space extension is not fine, that means "b" is not fine. "a" is fine, right? Or else? To sum up, what I wish to express originally is wider extension is fine. No need to be too close to the wall. That's what I wish to transmit. So do you agree the above statements or not? Bill: Among a, b, and c, which is a fine point for another Black stone? c.
Bill: Now, as people, we are all equals. But Charles and I are much better go players than you. If we disagree with you, you might consider first that we are right. If that does not make sense to you, you might ask a question. If everyone just trusts authority completely and follows traditional wisdom wholly, the society will hardly improve. It is because we challenge, new things and better ideas can be discovered/invented. Don't you think so? Charles Actually one can become a really strong go player without any wish to innovate. This is quite an interesting concept, in fact. aLegendWai: By the way, I think Charles has a very generous mind. He can stay calm even under severe criticism. On the contrary, I will lose control and get very unreasonable. I think I am very heated here recently. I have to mend my ways. Chris Hayashida: I don't get your diagram. Doesn't the extension have to be there on both sides before the invasion in order for the proverb to apply? Like this, for example. Even though is "too wide" it still seems proper to block in this direction to me. An invasion between and the black wall still seems scrunched to me. aLegendWai: It is easy. Since one stone is at "a" which is too narrow; but another stone is just a bit too wide (at "e"). To me, I will choose the lesser evil (ie block the side which has a stone "e"). However it is still not good. Anyway this rule still applies, Try to block on a side where it has a friendly stone at "c/d". If you can't find it, block on a side where it is nearest to "c/d".. Both stone placing equally bad. That is a situation where one stone is too narrow (at "a"). Another stone is too wide (at "f"). They are equally bad. What a pain! There is no good way to choose because choosing either side tend to get some problems. However if you block the lower side, the stone is too near and is considered as inefficient (Overconcentrated shape). If you block the upper side, you may feel your framework is much widened. But it is just an illusion. It is prone to invasion. 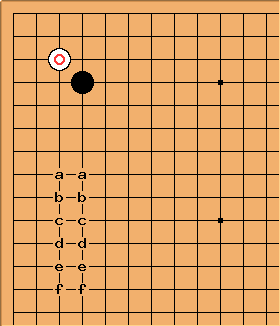 It is difficult for you to punish the opponent in this situation. My advice is to suggest you playing non-standard 3-3 invasion joseki. So you may make the most out of your friendly stones. Different 3-3 invasion variations have different requirement about the location of the friendly stones. It could be pages to explain and become off-topic. So I save it. Anyway, I believe that the trial of aLegendWai to imporve and redefine our traditional(?) Go proverb - "block on the wider side - is useless or might be even harmful for beginners. I mean, his own proverb - "Try to block on a side where it is not too narrow or too wide." - is nearly of no use. Charles This is reading forwards - I believe that strong players do it by so-called reading backwards, rejecting variations that leave one's stones misplaced. bud1027 : aLegendWai Um,,, to follow up and understand your complex and elborate reasoning and arguments is too hard and confusing for me...really hard. Maybe,,,it's because I'm too silly? Chris Hayashida: Okay, another example, to illustrate my point. I think that in this case, blocking at is correct. I don't think this contradicts the proverb, though. "Block on the side with the wider extension." I don't think it's correct to think of as an extension from the 4-4 stone, so I feel that even though is the correct move, it doesn't contradict the proverb. Is the marked stone a good move? No, but that's not part of the discussion. Does contradict the proverb? No, I don't think so either. Do I have an extension on either side? Arguing whether or not prior moves are good or in the correct place is irrelevant to the discussion of this proverb. In my experience teaching beginners, it is much easier to give proverbs stated as absolutes, like "Block on the wider side," and explain that proverbs will not always apply. It's much more confusing to give counterexamples for ever single idea as you are trying to teach, as the beginner usually ends up being more confused, and doesn't remember any of it. I'm glad that aLegendWai is at the point where he is starting to question the validity of some proverbs, and thinking of situations where they do not apply. I think he will become a stronger player as a result of it. However, I think it is counterproductive to Sensei's Library as a whole to start polluting the proverb pages with counterexamples, since it will be more confusing to those still trying to grasp the original principles. Charles I think counterexamples are fine; they do need to be quite clear. Well, I'm not a good go player, but I find his proverb very easy to understand, and it seems to be applicable in all discussed cases, even the ad ridiculo example. Thanks, aLW! aLegendWai: It is very happy when someone's work is recognized. The happiness is countless. And their recognition can inspire us with more good work. bud1027 : Sebastian Do you believe that aLW's proverb is more correct and understandable than our traditional(?) one? If so, surprising to me. Of course, This is beyond his ability. Bill: aLegendWai's dictum 100 is easy to understand and widely applicable, but so is take two aspirin. ;-) And the latter is probably better advice. Maybe I'm just like the patient who swallowed a suppository because he didn't understand the instructions. But I think the discussion page is the right place to ask why the suppository is better than the tablet. I may have missed it, but I didn't really see a case where the original proverb is better advice than aLegendWai's dictum 100. PS: Thank you, bud1027, for your dedication in teaching beginners, both on KGS and here. Your page SomeBasicTipsForFuseki is a very helpful guideline for understanding why I lose many games in the fuseki already. aLegendWai: I am a weak player. Here I wish to express my little opinion. You may agree or disagree. If better players don't explain some of behind assumptions or special meanings for some words, how can we be certain every beginner can get them right? Yes, the proverbs itself is short. So readers can understand it easily. But it is very limited in my humble opinion. They won't lead you far in my experience. There is a price for learning so easily - lose games! I remember someone said, 'Something is too easy is never good.' It seems particularly true in Go world. If you always keep things so simple, you will get lost easily in the real Go world. Go world is not that simple unfortunately. Different levels of players have different needs. A newbie may wish to remember the proverb only but no further - more information is trouble! A beginner may wish to know more about the proverb. So writing some brief notes is worthwhile. It may include some guides when the proverb is applicable, more comcepts about it etc. Stronger players may wish to grasp better. Then some application examples would give them more thorough understanding. More counter-examples are preferable. This page contain all we want. Different levels of player choose to learn different levels of things. I have a bad feeling in proverbs. Too obscure. Too high-handed (jokes :D). Its hidden things are like shields that always protect them in a unbeatable state. After all, it is my little opinion. 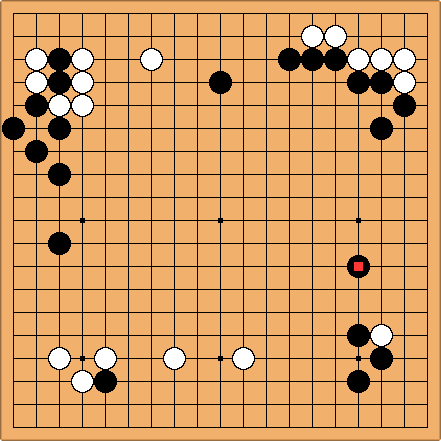 bud1027 : This is my real game that I played as white about 2 months ago at KGS. In that game, black actually played black-a ( a good move) instead of ( obviously silly and bad in my view) in this diagram. 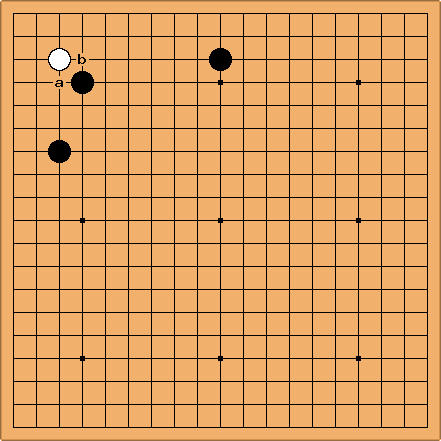 Anyway, let's assume that black plays and white invades 3-3 in right upper corner "Just For Our Discussion". 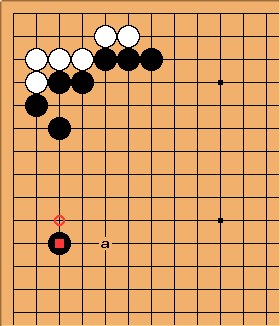 In this case, black has two options, q, and p.
Then, which is right direction to block for black? If we accept aWL's dictum100, the answer is black -"q". It's because is a stone that is nearer to his so-called a friedly stone at "c/d" than marked black stone in right side. Let's see what would happen if we play black q...After black q, two varations can be expected. These are shown in 2 diagrams below. Of course, it is possible to suppose other variations besides above two. But, these two are " most common and basic" variations, so I think that to see these two variations are sufficient for our discussion. Thus, it's enough for us to examine "just one basic variation" after black p for our discussion. O.K. Now, we have 3 options(variations) for black. I think, variation (c) ,- a result after black p move which is against aWL's dictum 100,- is best for black. Why? 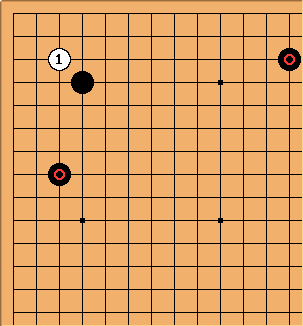 It's becase the focus of this game is black's right-side moyo, I mean, the focus ( or main focus) of this game is how large and much black can expand and secure his right-side moyo. In this respect, in my view, it is natural and right flow for black to put an emphasis on right side moyo by playing black p.
In conclusion, I believe that aLW's dictum 100 is not applicable in this case. And this is JUST one counter example of aLW's dictum 100, I can show you as many counter examples as I want. will help beginner or middle level players..
why? Preconditions are too many, and to make the meaning of Go proverbs precise with our present Go knowledge ( or Go theory) may be impossible, or will require writing books on that topic. What I mean is...to accept(regard) his dictum 100 as widely applicable and more precise one and to follow it mechanically may be very dangerous, and can cause misunderstanding on the meaning of our traditional(?) Go proverb - "Block on wider side ". In my opinion, this proverb -""Block on wider side "- can be interpreted in two ways roughly. The first way is to accept this proverb as "literally". For example, see this diagram below. 19x19 diagram - Fisrt interpretation. 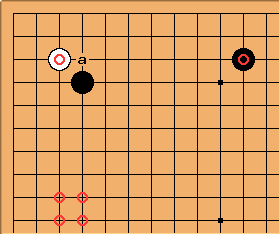 As you know, in this case, to play black b is "normally" better than black a. Upper side is wider than left side. This is a typical and elementary(basic?) 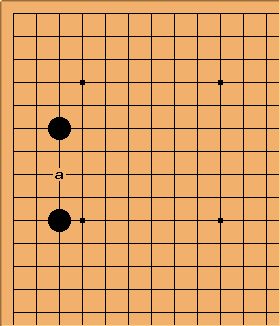 position in which we teach our Go proverb - block on the wider side -, saying them " see, in this black position, upper side is bigger and wider, so you should protect upper side by playing black b, you should block on wider side ,,,bla,bla,bla..so and so err...~~~!!!" 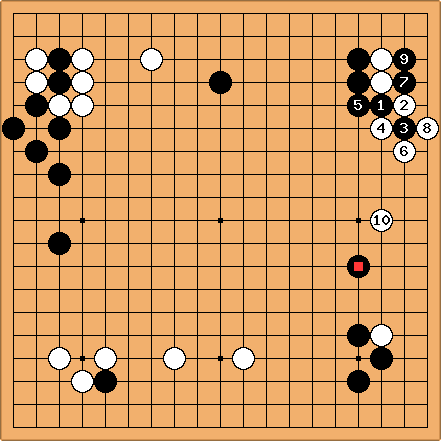 Of course, this Go proverb is incomplete, and has many exceptional cases. I mean,... sometimes to accept this Go proverb literally and plainly can cause bad moves. In such a case, what we need to do is NEVER to correct or make it perfect or make it applicable in all or almost cases by adding just some superflous phrases, - I say again, it is impossible...- BUT to teach them the reasons why to apply this Go-proverb literally can not work in that position, I mean, " case by case " with as many real games as possible,,,showing real pro or amateura games as example. 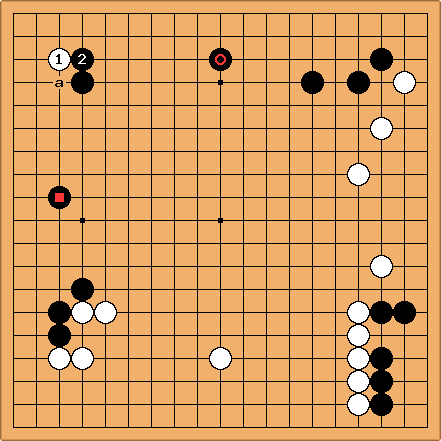 In fact, (in my view) the deeper meaining of this Go proverb is this : " to protect or to put emphasis on the side that has bigger potential territories..." and " to achieve this, basically you should block on wider side...in most cases "
Surely, there are exceptional cases. Blocking on wider side might be a move that protects "less valuable areas". Thus in this exceptional cases, to follow our Go-proverb literally is actually against it's real and deeper meaning or teaching. 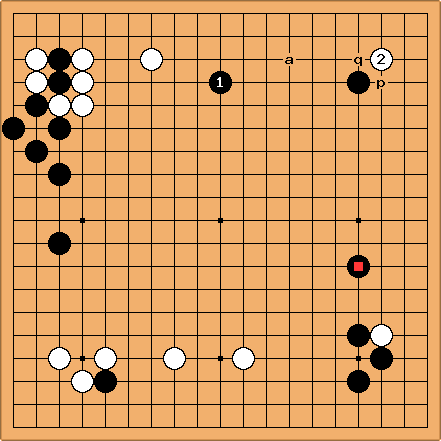 We should understand that there are two folding in meanings of our Go proverb, and...Um...to examine as many cases an possible (case by case) to grasp and learn how to deal with 3-3 invasion in our real games. And to learn how to judge these specific positions can not be achivied by simple adding or correcting Go-proverbs. No,,,it will just make our problems more complex and harder, i think. er...anyway, these are reasons why I'm against aLW's dictum 100. Bill: I have to apologize to aLegendWai. I just remembered something. As I learned it, the maximum width of an extension is 5 spaces. That corresponds to his c. So his dictum 100 boils down to a restatement of the original saying, "Block on the wider side" (assuming it is talking about extensions). aLegendWai: To clear one thing, I don't hold that the maximum width of an extension is 5 spaces. Bill: I did not think so, but I considered that that was an assumption of the original saying. If you want to apply dictum 100 more widely, not just to extensions, then here is a counterexample. aLegendWai: It is another situation of 3-3invasion. If you have friendly stones nearby, the strategy is different. It is beyond the issue which this proverb is working on - normal 4-4point 3-3 invasion (1 vs 1 local invasion). Yes, I think my work focus on this situation. If there're stones around, the joseki played differently too. So I deem it is another issue. Remember, make use of your friendly stones to further punish the invasion. ^p^ Don't waste them. Note: If there are friendly stones at (and no support of opponent stones around), the 3-3 invasion will fail. is closer to c than is to d, so dictum 100 tells us to block at . (Sebastian:) Thank you, this is very helpful. looks very clumsy indeed. I'm now convinced that dictum 100 has blatant exceptions, too. Making proverbs is an art. Maybe we should create a page Making Proverbs - A Do-It-Yourself Guide?. aLegendWai: To give my dictim 100 (^o^ Don't call my instructions - dictim 100. It gives misleading feeling!) some shields, I may list some exclusions (eg no friendly stones close to 4-4; no enemy stone close to 4-4; no whole-board concern) in order to make the instructions clearer that when they are suitable. In the above case, it is out of my scope in my opinion. Bill: I am the source of dictum 100. I apologize for any bad feelings or connotations that go with calling your idea that. (Sebastian:) I actually was happy to pick it up because I think it sounds pretty cool, and it helped clarify what exactly we were talking about. I gave it the footnote 100 because it's an easy number to remember. No bad intentions! Bill: IMO, there are too many go proverbs in English, as it is. In addition to the classical proverbs, which were devised by players of top strength and have withstood the test of centuries, we have modern proverbs, which were devised by amateurs and have been around for decades, at most. I do not know which kind this is. 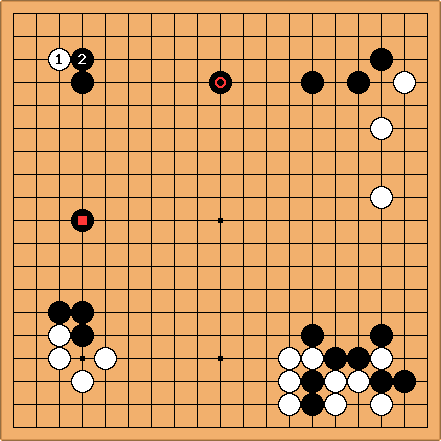 (I did not hear of it when I was learning go.) But I think it relies upon a hidden assumption, namely that you are going to make a wall and let the opponent have the corner. In that case you want your wall facing the further stone, as a rule. If, as in Charles's example, you are going to play the two step hane and take the corner, it does not apply, I think. (Sebastian:) Thank you, bud1027, for your extensive contribution above. You are certainly not lazy, and you need not worry about your English - it is easy to understand. I agree that listing detailed preconditions for each Go proverbs will not help. However, I do think that questioning proverbs on a discussion page can be very helpful, as has been the case here. aLW's question lead to important clarifications, such as Bill's explanation of what is meant by extension, or your distinction between the literal and the deeper meaning. This was a case of casting a brick to attract a gem. Moreover, since, as Bill pointed out, many proverbs have been created only recently, aLW may really be onto something. Maybe we should debunk some of them? Maybe this is one of them? Seeing that, once again, your explanation with potential territories works well, I am wondering if we shouldn't replace this proverb with: "Play always so that you protect or put emphasis on the side that has bigger potential territories." Bill: In a real game? 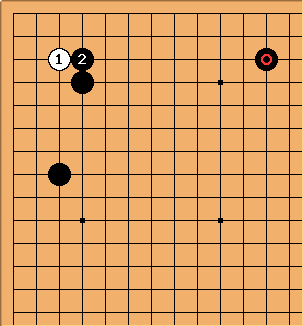 In a real game, doesn't White play a kakari instead of invading on the 3-3, when Black's other stones are so far away (6 and 8 spaces)? ilanpi: I suggest renaming this topic "Take a Block on the Wide Side." Sorry, couldn't resist it.